Getting the rub of the green is a nice feeling. There have been enough bad calls against Leicester City this season, so it was nice to see some karmic retribution meted-out and the Foxes win their first penalty kick of the season. Paul Gallagher made no mistake in slotting-home the spot-kick in his trademark style. Once again the Foxes are on the verge of the play-offs. Once again Leicester City lie just two points adrift of sixth and a coveted play-off slot. With Sven Goran Eriksson's side bottling it with every opportunity to enter the top six, it will be very interesting to see if a Leicester City led by caretakers - or indeed by a new man - can end that two-year-old duck against Leeds on Sunday afternoon. Another great performance from a man who is also continually popping-up with crucial goals. David Nugent restored the Foxes' lead before the hour with a deft header thanks in no part to the work of Richie Wellens and Paul Gallagher but his diligent work throughout this fixture - and against West Ham United at the weekend - cannot go unnoticed. Ex-Liverpool full-back Paul Konchesky has had his critics of late, but nobody could argue against the Premier League class of his opening goal. A superb effort from long range, the 30-year-old is light years ahead of the likes of Bruno Berner in the left-back pecking order. Points for audacity alone, Wellens' sumptuous back heel allowed Gallagher the space in which to pivot and provide the cross from which Nugent put Leicester ahead. The phrase 'liquid football' springs to mind. The Wellens haters should be rightly silenced after this performance, whilst Gallagher will be satisfied that he was able to show what Leicester City have been missing as he returned from injury - including a trademark spot-kick. This was a very disappointing performance from the returning Neil Danns and he has done himself no favours to stake a claim for a place in the very competitive Foxes midfield. The young Dane will be horrified that it was his mis-handling that allowed Burnley to equalise just three minutes after the Foxes grabbed a deserved lead. Kasper Schmeichel would be horrified too if he were to read that, for the first time this season, he is amongst the Losers for that single reason. The goalkeeper remains the best signing made by Eriksson but his form does seem to be slipping of late, with mistakes beginning to creep in to his game. 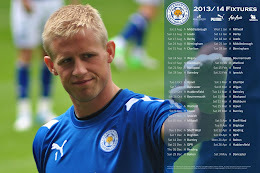 A need to impress his obvious raw talent on a new manager could be just the boost Schmeichel requires.